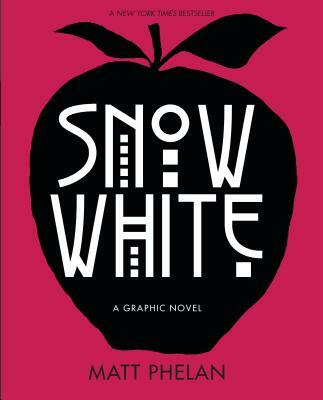 Snow White: A Graphic Novel (Paperback) | Let's Play Books! Matt Phelan is the author-illustrator of three previous graphic novels: the Scott O’Dell Award–winning The Storm in the Barn, Around the World, and Bluffton, which was nominated for three Will Eisner Comic Industry Awards, including Best Graphic Album. He is the author-illustrator of Druthers and the illustrator of many books for young readers, including Marilyn’s Monster by Michelle Knudsen and The Higher Power of Lucky by Susan Patron, winner of the Newbery Medal. Matt Phelan lives in Pennsylvania. Matt Phelan sets his graphic retelling of “Snow White” in 1920s New York, with both its Ziegfeld Follies glamour and its impoverished Dead End Kids. The visuals are deeply effective: entire sections are wordless, propelling the reader through dramatic scenes and inviting reflection during quiet, contemplative spots...Pencil, ink, and watercolor illustrations break out of loose panel structuring; sharp lines and shadow heighten tension and expanses of open white space sometimes draw the eye to a specific scene. This graphic novel will find a welcome home with fairy-tale fans who have outgrown the Disney version (or, less likely, the Grimm version) but still find the tale compelling. Phelan (Bluffton) delivers a spectacular 20th-century update of “Snow White,” transplanting the story to Jazz Age and Depression-era New York City, where themes of jealousy, beauty, and power find a comfortable home...Moody gray and sepia panels carry the story forward, punctuated by splashes of lurid red—for an animal heart, procured at a butcher’s shop, or an apple tainted with a syringe. Snow’s affectionate relationship with “the Seven,” a group of street children, is among this adaptation’s most potent elements. The boys are hesitant to tell Snow their names, but readers will want tissues on hand when they finally do. Spanning the Roaring Twenties and the Great Depression, Phelan’s noir-esque adaption of the classic fairy tale is atmospheric, clever, and touching...Especially resonant are the relationships that the heroine builds with her young protectors. The last few colorful pages will tug at heartstrings as Snow, the Seven, and an intrepid Detective Prince get their happy endings. A stunning, genre-bending graphic novel for all middle grade and middle school collections. Phelan masterfully shifts a tale heavily reliant on magic and fantasy into a realistic and historical setting without compromising plausibility. Creating sweeping and dreamy watercolors that play with emotion and color, Phelan is an exquisite visual storyteller, and he lets expressive, wordless sequences carry a large portion of his interpretation. With a keen historical slant, a bit of action and intrigue, high visual interest, and the fairy-tale leaning, this will awe a wide readership. Brilliant. Pencil, ink, and watercolor images (in mostly sepia tones, with occasional spots of color: red for the poisoned apple, for example) move readers’ eyes across each page, providing an appropriately cinematic noir sensibility. This cinematic effect is further enhanced by the feel of constant movement, the varied panel sizes, and a judicious use of text. Some scenes are wordless; for others, Phelan uses varied fonts to enhance the drama. By the final wordless all- color sequence (spoiler: there is a happy ending), it is clear that this is an original and darkly beautiful take on the classic tale. In a series of silent-movie-like vignettes, Phelan puts a Jazz Age spin on the classic tale of Snow White...Readers hungry for graphic adaptations of fairy tales will find their appetites slaked here. I don’t think I’ve ever actually enjoyed the story of Snow White until now. Hand this book to graphic novel fans, fairytale fans, and any kid who’s keen on good triumphing over evil. Fans of Snow White will enjoy this new take on the beloved tale—a graphic novel set in Depression-era New York...All of the illustrations are full of emotion, propelling the story forward quickly with minimal dialogue. How Phelan manages to tell this nail-biter of a story with so few words in comic-strip panels is a testimony to his great talent, and his murky pencil, ink and watercolor artwork elegantly captures the ominous mood. Dark, gorgeous and ultimately heartening. Phelan’s wonderfully expressive and realistic faces do most of the storytelling, and readers will linger on the dynamic structure of each page, as the artist’s characteristic soft edges contrast with interesting page layouts...Fans of Brian Selznik’s books will enjoy this one. Film noir and fairy tales each offer their own unique escapes into worlds that dramatize our fears and fantasies. In Snow White: A Graphic Novel, Phelan draws from the best parts of each form to create both a hardcover hideout and an artful homage to be read and revisited panel by panel, frame by frame. Nowhere is Phelan's combination of drawing prowess and storytelling ability more on display than in his 2016 graphic novel Snow White, which is sparing in its use of text, conveying most of the story solely through its artwork.